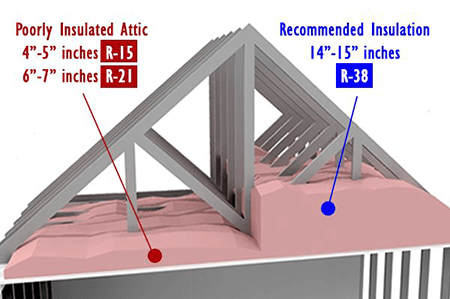 Blown-in Insulation Service and Attic Tent Installation in the Greater Conroe, TX area. Attic insulation is equally important to selecting the right air conditioning equipment and duct system for your home. Proper insulation will increase energy savings and can contribute to better personal comfort in your home. Can you see the tops of your roof rafters above the insulation? If so you probably don’t have enough attic insulation. 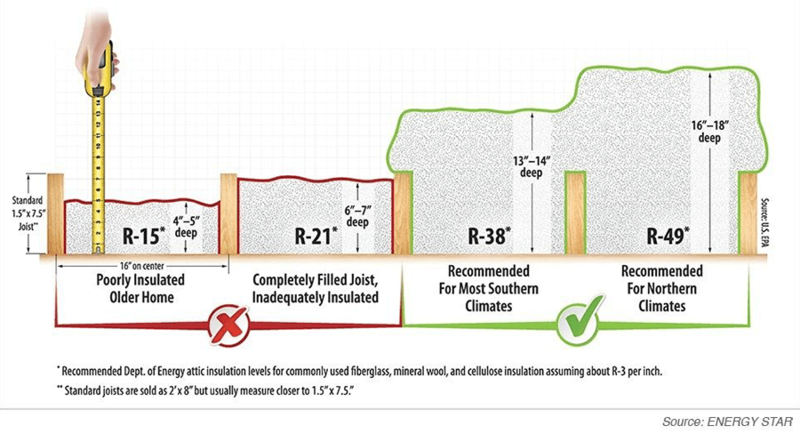 The following graphic from ENERGY STAR illustrates examples of poor insulation as well as recommended insulation amounts for Northern and Southern climates. Generally, a poorly insulated, older home might have insulation that is only 4-5″ deep (R-15), not quite filling the standard joist. Even if the standard joist is completely filled (6-7″ deep, R21), it is still considered inadequately insulated. For most Southern climates, 13-14″ of insulation is recommended, while 16-18″ is the recommended amount for Northern climates. The attic entrance is another major energy expense if not properly addressed and often forgotten. 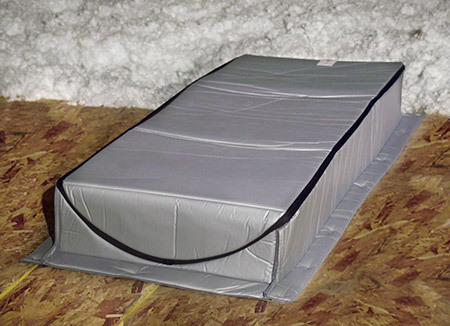 Installation of an insulated attic tent has many benefits. Seals heat and humidity in attic from entering the home. Seals dust particles, insulation and bugs from entering the home. Helps alleviate allergens from entering the home.